How hard can it be to use a mouse, anyway? How hard can it be to use a mouse, anyway? Harder than you think! More important than whether you know how to use it, do you know if your customers know about it? I’ve always thought it was a fairly advanced interaction technique, something that average computer users don’t know about. I saw people clicking the right-mouse button in a study this year. They must have learned about it at some point or they probably wouldn’t have tried it. But they were clearly lost and using it as a last resort. 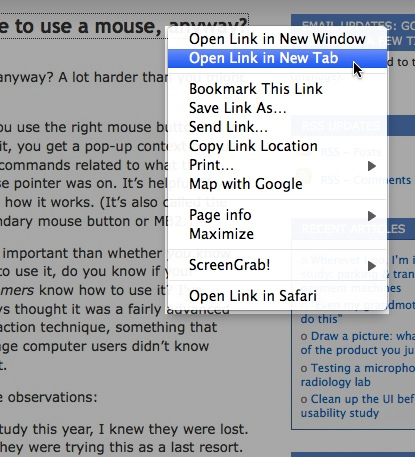 In an earlier study, some important features were only available through the pop-up context menu. People who didn’t know about it could never find those important commands and were unable to get their tasks done. That doesn’t mean you should never use the right-mouse button when you design an application. Many people do know about it and depend on it for efficiency. But don’t assume that people will use it. Anything available on that context menu must be available (and obvious) somewhere else. Usability studies are great for finding problems in a product under development. But we don’t only learn about bad things. Sometimes we hear positive comments and compliments. Here are some quotes from previous studies showing how a product met users’ expectations or pleased them in some way. It’s nice to get compliments like this. What positive things have you heard in usability studies? Do your colleagues (or clients) appreciate the positive remarks, or are they just interested in looking for problems to fix?